In 2009, the Riksdag passed the Language Law recognizing Swedish as the main and common language of society as well as being the official language in "international contexts", the five national minority languages, and Swedish sign language . For most of its history, Sweden was a larger country than today. At its height in 1658, the Swedish Empire comprised the territories of what is Finland and Estonia as well as parts of Russia, Latvia, Germany, Denmark and Norway. Hence, Sweden's linguistic landscape has historically been very different from that of today. Swedish evolved from Old Norse around the 14th and 15th century, and historically, the Swedish dialects were generally much more different than today. Since the 20th century Standard Swedish prevails throughout the country. The Scandinavian languages constitute a dialectal continuum and some of the traditional Swedish dialects could equally be described as Danish (Scanian) or Norwegian (Jamtlandic). Finnish was the majority language of Sweden's eastern parts, though it was used almost exclusively as a spoken language. These areas were also home of a significant Swedish-speaking minority. Finnish became a minority language in the west as well since many Finnish speakers migrated there (mostly for economic reasons). Estonian was the language of the majority in Swedish Estonia but the province, like Finland hosted a Swedish-speaking minority and also a more significant minority of Germans. In medieval Sweden, the Low German language had a very important role as a commercial language and the lingua franca of the Hanseatic league. As such, the Low German language influenced Swedish and other languages in the region considerably. In medieval Stockholm, half of the population were Low German speakers. Low German was also the language spoken in the 17th-century Swedish territories in northern Germany i.e. Swedish Pomerania, Bremen-Verden, Wismar and Wildeshausen (as well as the rest of northern Germany) and by the German minority in Estonia and Swedish Livonia. Livonia was also inhabited by Latvians, Estonians and Livonians. Latin as the language of the Catholic Church was introduced in Sweden with the Christianisation, around AD 1000. As in most of Europe, Latin remained the lingua franca and scholarly language of the educated communities for centuries in Sweden. For instance, Carl Linnaeus' most famous work Systema Naturae, published in 1735, was written in Latin. Gradually Sweden lost its overseas possessions and obtained its current borders in 1809, when it lost its eastern part (Finland) to the Russian Empire. As a consequence, Sweden became a rather homogeneous country with the exceptions of the indigenous Sami-people and the Finnish-speaking Tornedalians in the northernmost parts of the country. During the 19th century Sweden became more industrialised, resulting in important demographic changes. The population duplicated and people moved from the countryside to towns and cities. As a consequence, of this and factors such as generalised education and mass media, the traditional dialects began to give room for the standard language (Standard Swedish). A large number of Swedes also decided to emigrate, especially to the United States. There, the Swedes came in contact with the English language. Since then, as in the rest of Europe and much of the world, English has grown as an important foreign language in Sweden, especially since the allied victory in World War II. During the second half of the 20th century and the first decade of the 21st century, Sweden has received great numbers of immigrants who speak languages other than Swedish (see: Immigrant languages below). It is unclear to what degree these communities will hold on to their languages and to what degree they will assimilate. In 2009, the Riksdag passed the Language Law (SFS 2009:600) which contains provisions concerning the Swedish language, the five national minority languages ​​and the Swedish sign language. Among its provisions is the general mandate to safeguard the Swedish language, the linguistic diversity in Sweden, and the individual's access to language. The Kingdom of Sweden is a nation-state for the Swedish people, and as such, their national language is held in very high regard. Of Sweden's roughly ten million people, almost all speak Swedish as at least a second language, and the majority as a first language (7,825,000, according to SIL's Ethnologue). Swedish is also an official language in Finland where it is spoken by a large number of Swedish-speaking Finns. The language is also spoken to some degree by ethnic Swedes living outside Sweden, for example, just over half a million people of Swedish descent in the United States speak the language, according to Ethnologue. The Language Law of 2009 recognizes Swedish as the main and common language of society as well as being the official language in "international contexts". A number of Swedish dialects exist, some of which are divergent enough from standard Swedish to be considered separate languages. Westrobothnian is a common name used to refer to a number of closely related Germanic, North Germanic languages spoken in historical Westrobothnia (modern coastal areas of Westrobothnia and Norrbotten) bordering areas with speakers of Sami to the west, Meänkeli Finnish to the north, Jamtlandic to the south-west and dialects of national standard Swedish to the south. Like other Scandinavian languages, all different forms of Westrobothnian originate in Proto-Norse and dialects of Old Norse that started diverging as distinct languages during the Viking Age. Dialects differ greatly between different areas and the language has traditionally merely been a spoken language since no standard spelling was available. The following cities and surrounding villages have a traditionally Westrobothnian speaking population: Piteå, Skellefteå, Umeå, Luleå and Kalix. Spoken mainly in Jämtland, but with a scattered speaker population throughout the rest of Sweden, Jamtlandic or Jamska is a West Scandinavian language with 95% lexical similarity to Norwegian and Swedish, but generally more archaic. It has a native speaker population of 30,000. The Swedish province of Scania. Spoken in the Swedish province of Scania (Skåne in Swedish), the Scanian dialect is considered by some to be a dialect of Danish, and a related dialect is also spoken in Bornholm, where it is called "East Danish" (Scania was part of the kingdom of Denmark until 1658). The variety generally spoken today is heavily influenced by standard Swedish. In 1999, the Minority Language Committee of Sweden formally declared five minority languages of Sweden: Finnish, Meänkieli (also known as Tornedal, Tornionlaaksonsuomi or Tornedalian), the Sami languages, Romani, and Yiddish. The Language Law of 2009 confirms the recognition of these five languages as "national minority languages". Today there are about 470,000 Finnish-speakers in Sweden. Finnish, a Uralic language, has long been spoken in Sweden (the same holds true for Swedish in Finland, see Finland-Swedes, Åland), as Finland was part of the Swedish kingdom for centuries. Ethnic Finns (mainly first and second generation immigrants) constitute up to 5% of the population of Sweden. A high concentration of Finnish-speakers (some 16,000) resides in Norrbotten. Meänkieli is also a Finnic language. Spoken by the Tornedalian people, it is so closely related to Finnish that they are mutually intelligible, and is sometimes considered a dialect of Finnish. Meänkieli is mainly used in the municipalities of Gällivare, Haparanda, Kiruna, Pajala and Övertorneå, all of which lie in the Torne Valley. Between 40,000 and 70,000 people speak Meänkieli as their first language. The Sami people (formerly known as Lapps) are a people indigenous to all of northern Scandinavia (see Sápmi (area)) who speak a closely related group of languages usually grouped together under the name "Sami", but at least three separate Sami languages are spoken in Sweden. They are, like Finnish and Meänkieli, Uralic. Prolonged exposure to Germanic-language-speaking neighbors in Sweden and Norway causes them to have a large number of Germanic loanwords not normally found in other Uralic languages like Finnish, Estonian, or Hungarian. Between 15,000 and 20,000 Sami people live in Sweden of whom 9,000 are Sami-language speakers. Worldwide, between 20,000 and 40,000 people speak Sami languages (most Sami now speak Swedish, Norwegian, Finnish, or Russian as their first language, depending on the country in which they reside). In Sweden, the largest concentrations of Sami-language-speaking Sami are found in the municipalities of Arjeplog, Gällivare, Jokkmokk and Kiruna, and its immediate neighbourhood. Romani (also known as the Romani Chib) is the language spoken by the Romani people, a nomadic ethnic group originating in northern India. Due to the geographic origins of its speakers, Romani is an Indo-Aryan language, closely related to languages spoken in modern-day India, and sometimes written with an Indic Script (see Romani writing systems). Around 90% of Sweden's Romani people speak Romani, meaning that there are approximately 9,500 Chib speakers. 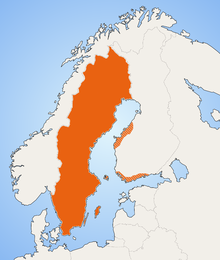 In Sweden, there is no major geographic center for Romani like there is for Finnish, Sami, or Meänkieli, but it is considered to be of historical importance by the Swedish government, and as such the government is seen as having an obligation to preserve them, a distinction also held by Yiddish. Yiddish is a Germanic language with significant Hebrew and Slavic influence, written with a variant of the Hebrew Alphabet (see Yiddish orthography) and, formerly, spoken by most Ashkenazic Jews (although most now speak the language of the country in which they live). Although the Jewish population of Sweden was traditionally Sephardic, after the 18th century, Ashkenazic immigration began, and the immigrants brought with them their Yiddish language (See History of the Jews in Sweden). Like Romani, it is seen by the government to be of historical importance. The organisation Sällskapet för Jiddisch och Jiddischkultur i Sverige (Society for Yiddish and Yiddish Culture in Sweden) has over 200 members, many of whom are mother-tongue Yiddish speakers, and arranges regular activities for the speech community and in external advocacy of the Yiddish language. As of 2009, the Jewish population in Sweden was estimated at around 20,000. Out of these 2,000-6,000 claim to have at least some knowledge of Yiddish according to various reports and surveys. The number of native speakers among these has been estimated by linguist Mikael Parkvall to be 750-1,500. It is believed that virtually all native speakers of Yiddish in Sweden today are adults, and most of them elderly. Swedish Sign Language is an officially recognized language. Knowledge of foreign languages in Sweden, in per cent of the population aged 15 and above, 2005. Data taken from an EU survey ebs_243_en.pdf (europa.eu). Since the Middle Ages until the end of World War II, Germany was usually the country outside Scandinavia having the closest cultural, commercial and political relations with Sweden. Thus, study of the German language had always been promoted by the Swedish state as the main foreign language. Many of Sweden's administrative and social institutions, including the education system, had also been organised along the German and Prussian model, as a lot of Swedish pioneering intellectuals of the Seventeenth century had been educated in German universities. This changed after the end of the Second World War, when it was no longer acceptable to emphasise a closer link with defeated Germany. A majority of Swedes, especially those born after World War II, are able to understand and speak English thanks to trade links, the popularity of overseas travel, a strong American influence, especially in regards to arts and culture, and the tradition of subtitling rather than dubbing foreign television shows and films. English, whether in American, Commonwealth (Australian, Canadian, and Kiwi), or British dialects, became a compulsory subject for secondary school students studying natural sciences as early as 1849 and has been a compulsory subject for all Swedish students since 1952, when it replaced German as the compulsory language subject. Depending on the local school authorities, English is currently a compulsory subject from third until ninth grade, and all students continuing in secondary school study English for at least another year. Most students also learn one and sometimes two additional languages; the most popular being German, French and Spanish. From the autumn semester 2014, Mandarin Chinese is proposed as a fourth additional language. Some Danish and Norwegian is, at times, also taught as part of the Swedish course taught to native speakers of Swedish to emphasize differences and similarities between the languages. There is currently an ongoing debate among linguists whether English should be considered a foreign language, second language or transcultural language in Sweden (and the other Scandinavian countries) due to its widespread use in education and society in general. This has also triggered opposition: in 2002 the Swedish government proposed an action plan to strengthen the status of Swedish and in 2009 Swedish was announced the official language of the country for the first time in its history. In 2013, for the second year in a row, Swedes were ranked as best in the world at speaking English by the language proficiency company EF English First. Like many developed European countries from the late 1940s to the 1970s, Sweden has received tens of thousands of guest workers from countries in Southern Europe and the Middle East (i.e. Bulgaria, Greece, Iraq, Italy, Romania, Spain, Syria, Turkey, and the former Yugoslavia). Second and third-generation Swedes of Southern European or Middle Eastern descent have adopted Swedish as their main tongue, or in addition to their immigrant languages, such as Arabic, Bulgarian, Greek, Italian, Bosnian/Serbian/Croatian, and Turkish. However, the criteria in European Charter for Regional or Minority Languages state that minority languages need a long history in the country to receive the classification, and thus, these languages have not come into question. ^ "Tilastojen kertomaa: RUOTSINSUOMALAISET 2009 - Sisuradio". Sverigesradio.se. Retrieved 5 October 2017. ^ "אַ סך-הכּל פֿון דער פּאָליטיק פֿון דער" (PDF). Manskligarattigheter.org. Retrieved 5 October 2017. ^ Mikael Parkvall (2009). "Sveriges språk. Vem talar vad och var?. RAPPLING 1. Rapporter från Institutionen för lingvistik vid Stockholms universitet" (PDF). Sprakforsvaret.se. pp. 68–72. ^ "Europeans and their Languages" (PDF). Ec.europa.eu. Retrieved 6 October 2017. ^ "Europeans and their Languages" (PDF). Special Eurobarometer 243 / Wave 64.3 - TNS Opinion & Social. European Commission. February 2006. Retrieved May 3, 2011. According to this Eurobarometer survey, 89% of respondents in Sweden indicated that they know English well enough to have a conversation (p. 152). Of these 35% had a very good knowledge of the language, 42% had a good knowledge and 23% had basic English skills (p. 156). ^ "English spoken - fast ibland hellre än bra" (in Swedish). Lund University newsletter. July 1999. Archived from the original on 2011-04-30. ^ Sveriges språk, vem talar vad och var Mikael Parkvall, Stockholm University p.100 Men är engelska verkligen ett främmande språk? ^ Regeringskansliet, Regeringen och (20 September 2017). "Government.se". Regeringskansliet. Retrieved 5 October 2017. ^ "Swedes 'best in the world' at English - again". Thelocal.se. 2013-11-07. Retrieved 2017-08-11. ^ "Swedish". Ethnologue.com. Retrieved 5 October 2017. ^ "United States". Ethnologue.com. Retrieved 5 October 2017. ^ Dieter W. Halwachs. "Speakers and Numbers" (PDF). Romani.uni-graz.at. Retrieved 6 October 2017. ^ "Här är 20 största språken i Sverige". Språktidningen. Retrieved 5 October 2017. This page was last edited on 4 January 2019, at 17:18 (UTC).